Ryan Nugent-Hopkins had two goals heading into his NHL rookie campaign seven years ago: contribute to team success and do whatever he could to contribute to the community. Ryan Nugent-Hopkins had two meaningful goals heading into his NHL rookie campaign seven years ago: do whatever he could to contribute to team success and do whatever he could to contribute to the community. Although the announcement caught him by surprise, it was certainly not unexpected that Nugent-Hopkins found his name on the list for the 2018 King Clancy Memorial Trophy, awarded "to the player who best exemplifies leadership qualities on and off the ice and has made a noteworthy humanitarian contribution in his community." On Wednesday night in Las Vegas, the Sedin twins, Daniel and Henrik, were named this year’s recipients. The first overall selection in 2011 has lent his efforts to numerous charitable causes and organizations throughout a big-league career that stands at 457 regular season games. Part of the Hockey Helps Kids initiative, co-founded by Chloe and Harrison Katz, children of Oilers Entertainment Group Chairman Daryl Katz and his wife Renee, Nugent-Hopkins won the Charity Cup this past season. Hockey Helps Kids sees four participating schools each pair up with an Oilers player and then choose one local charity to form their team. Each team develops a two-minute video outlining why its cause is worthy of fan votes and donations. The team with the most fan votes wins a prize of $25,000 for its charity (along with participation awards of $10,000 each for the three runners-up). 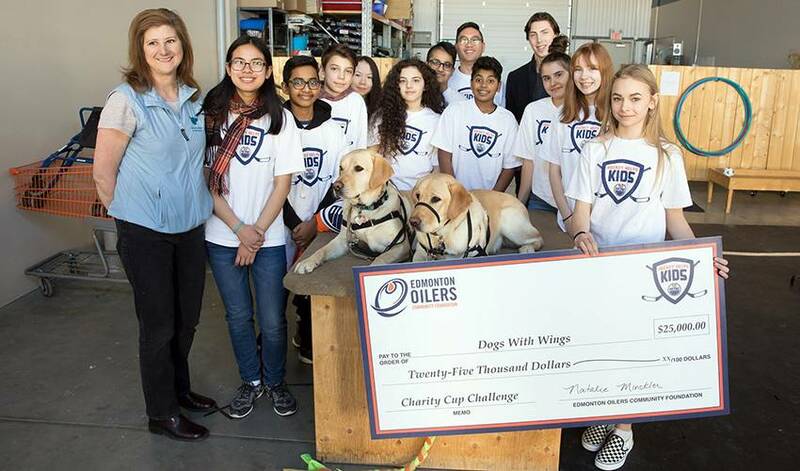 Mary Butterworth School, who teamed with Nugent-Hopkins, donated $25,000 to the Dogs with Wings charity. The organization’s mission is “to foster integration and independence for Albertans with disabilities by providing them with highly trained assistance dogs and aftercare." The centre and alternate captain has also worked with Sport Central, an organization that gathers, recycles and redistributes sports equipment to kids who would otherwise be denied the opportunity to participate. “It’s huge right now and it’s a great cause,” he said. Nugent-Hopkins’ good deeds don’t end there. He’s also been involved (for seven years) in the Faceoff with CF (Cystic Fibrosis) Gala as the honourary Chairperson of the event. Aside from shining the light on the disease Nugent-Hopkins spends quality time those battling CF. One big smile is all it takes to remind Nugent-Hopkins of the impact a small gesture has.